Wrocław - the foremost city of southwestern Poland. This city, which was reduced to ruins during World War II, today enchants visitors with the charm of its rebuilt Old City and numerous historic buildings. A city of over 100 bridges, seen from a bird's-eye view it creates the impression of an island floating on water. - after breakfast meeting with local guide and departure for full day city sightseeing tour with visiting Racławice Panorama. 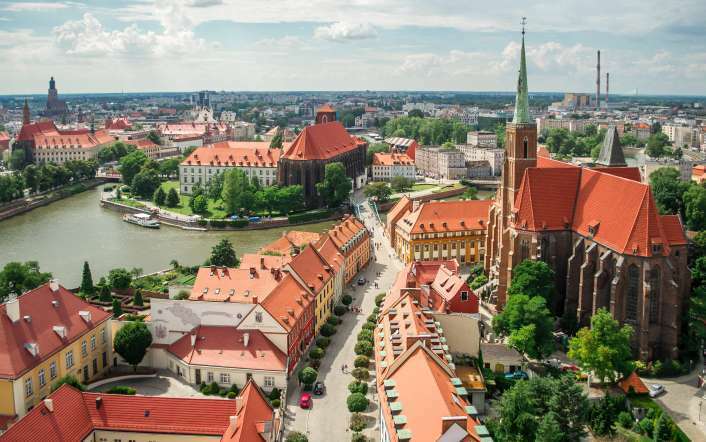 Programme of sightseeing: Visit at Ostrów Tumski - the oldest part of Wrocław - with numerous Gothic churches, the most precious of them St John the Baptist Cathedral, founded in 1244, contains remains of the first, Romanesque church. Walk through the Old Town with beautiful Town Hall erected in 1241, now a museum, and many picturesque Renaissance and Baroque tenement houses. Stop at Wrocław University with magnificent beautiful Baroque Leopold Aula style room constructed in the 18th century, full of paintings, sculpture, gold-plated stuccoes and other decorations. The Racławice Panorama - one of the most important and popular attractions in Wrocław. It is a busy place and visited by hundreds of people every day. The painting by Jan Styka and Wojciech Kossak (with many assistants) was made between August 1893 and May 1894 to add splendour to the National Exhibition in Lvov (now in the Ukraine). This immense painting (120 x 15 m) is also a combination of real 3 dimensional items in the foreground (contemporary vehicles, a wood, road, equipment etc.) and creates a 360 degree very realistic perspective of the battlefield at Racławice.